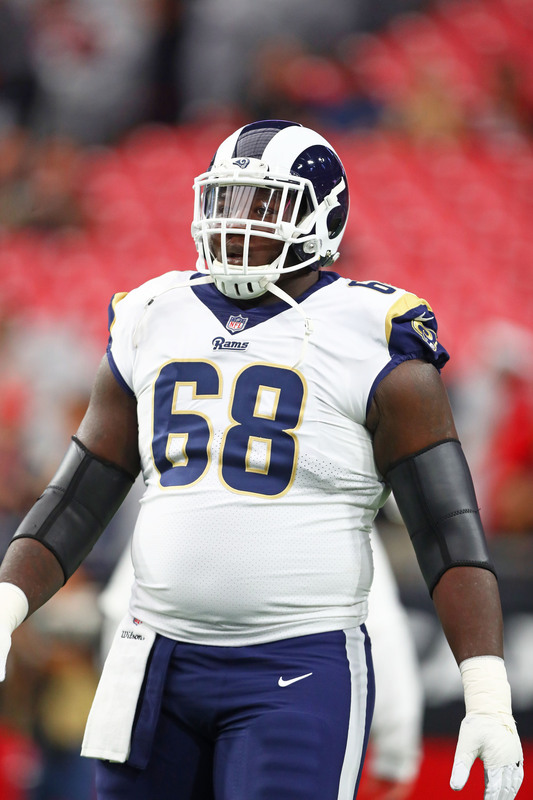 A full-time starter for the 2017 Rams, Jamon Brown received notice on Tuesday he was being waived. He will not pass through waivers to free agency and didn’t advance far through the claim hierarchy. The Giants claimed Brown on Wednesday, Adam Schefter of ESPN.com tweets. The offensive line-needy team is 1-7 and getting a player in a contract year, but Brown figures to see action soon in the Big Apple. Brown served as the Rams’ starting right guard during their playoff drought-snapping 2017 slate, and the former third-round pick had started 30 games since the 2015 season. But a suspension sidetracked his run in Los Angeles. Austin Blythe took over because of Brown receiving a two-game substance-abuse ban. Brown worked as a backup in five games this season before the Rams waived him to make roster room for Dante Fowler. This season has obviously not gone well for the Giants. They made multiple sellers’ trades, in shipping out two defensive starters, and have struggled in many areas. Their most key problem, though, is still their offensive line. Eli Manning‘s taken 31 sacks, despite Nate Solder and Will Hernandez now being in the fold. That matches his 15-game total from 2017 and is on pace to be well north of the 15th-year veteran’s previous career high. Big Blue also recently benched Patrick Omameh, opening a spot at right guard. Brown’s contract-year status doesn’t make much sense for the 2018 Giants, but they’re in need of blockers regardless. With answers long-term answers needed, it’s probable the Giants are ready to evaluate the longtime starter to see if he’s a candidate for an extension. Brown being in a contract year is pretty much irrelevant. He is a waiver pick up, so the Giants are not likely going to need to pony up much to retain him if that’s what they decide to do. What the writer really meant to say, At this point any one on the street over 280lbs is an upgrade whether he/she has played football before.